Figure 1. 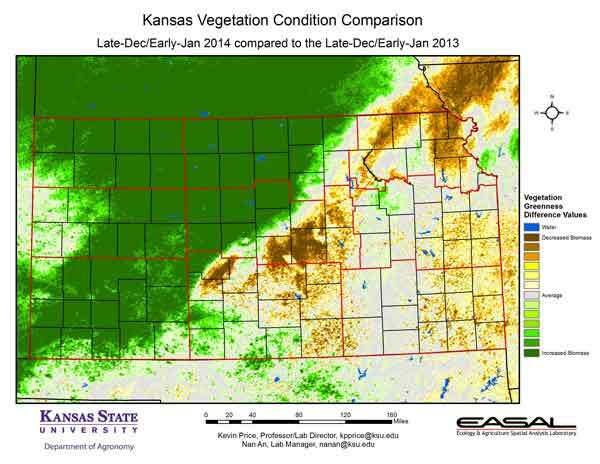 The Vegetation Condition Report for Kansas for December 24 – January 6 from K-State’s Ecology and Agriculture Spatial Analysis Laboratory shows that the entire state was impacted by snow. Amounts and the liquid equivalent of the snowfall varied greatly. Areas of heaviest snow were in a diagonal from Clark County in Southwest Kansas to Atchison and Leavenworth counties in northeast Kansas. Figure 2. 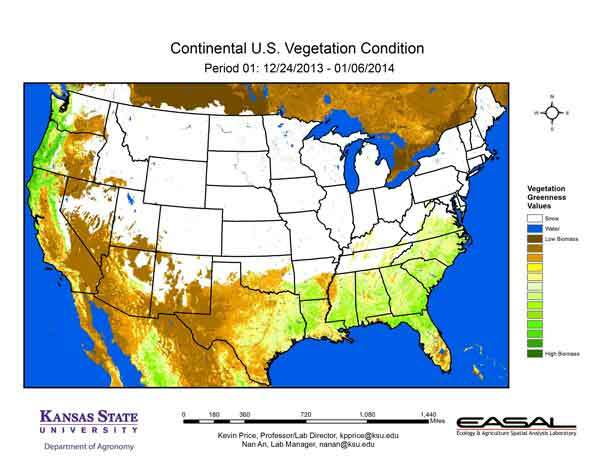 Compared to the previous year at this time for Kansas, the current Vegetation Condition Report for December 24 – January 6 from K-State’s Ecology and Agriculture Spatial Analysis Laboratory shows that western Kansas has higher photosynthetic activity this year. 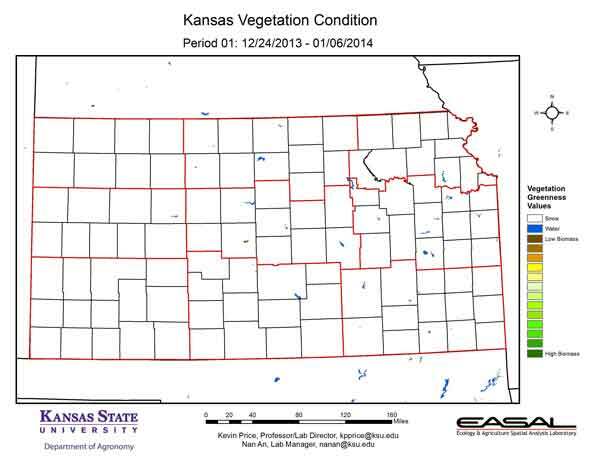 Most of central and eastern Kansas are showing lower photosynthetic activity. For Western Kansas, much of the difference is due more to the earlier fall precipitation rather than the most recent amounts. In the northwest, for example, the average precipitation is 11 percent of normal for the period, compared to 119 percent last year. However, the September-to-present average is 103 percent of normal this year compared to just 55 percent of normal last year. Figure 3. 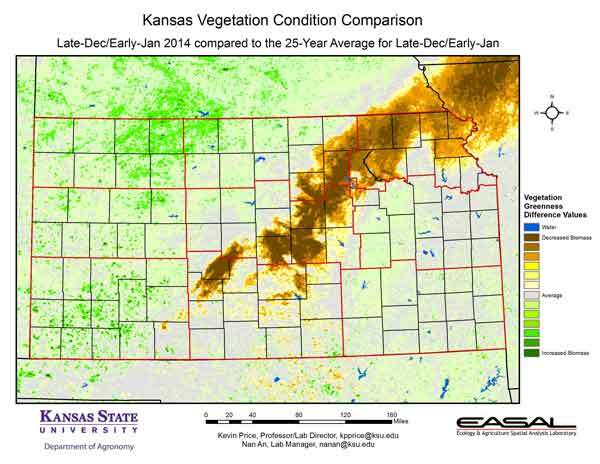 Compared to the 25-year average at this time for Kansas, this year’s Vegetation Condition Report for December 24 – January 6 from K-State’s Ecology and Agriculture Spatial Analysis Laboratory shows that biggest departure is along a diagonal from Edwards County in south central Kansas through northeast Kansas in the Atchison, Doniphan county ranges. This corresponds to the area of heaviest and most persistent snow cover during the period. Figure 4. 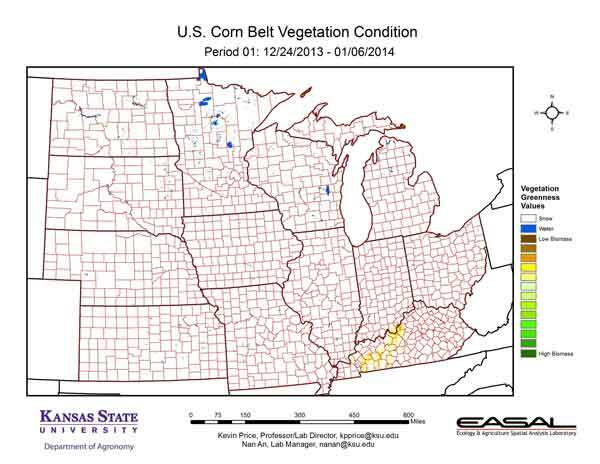 The Vegetation Condition Report for the Corn Belt for December 24 – January 6 from K-State’s Ecology and Agriculture Spatial Analysis Laboratory shows that the entire region had snow during the period. Amounts varied, with heaviest totals in the northern and eastern portions of the Corn Belt. Figure 5. The comparison to last year in the Corn Belt for the period December 24 – January 6 from K-State’s Ecology and Agriculture Spatial Analysis Laboratory shows that greatest increase in photosynthetic activity are in areas where snow cover has not persisted. There is a sharp line in Kentucky that is most likely due to cloud contamination. Figure 6. 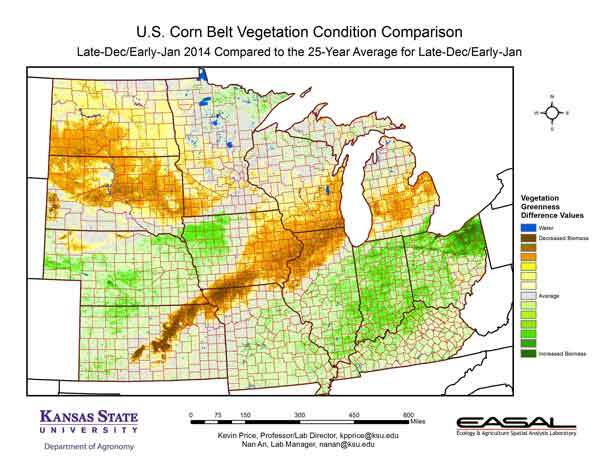 Compared to the 25-year average at this time for the Corn Belt, this year’s Vegetation Condition Report for December 24 – January 6 from K-State’s Ecology and Agriculture Spatial Analysis Laboratory shows that there is an area of below-average biomass production from central Kansas through eastern Iowa and northern Illinois. This corresponds to areas of persistent snow cover. Lamoni, Iowa ended the period with 8 inches of snow cover. Figure 7. 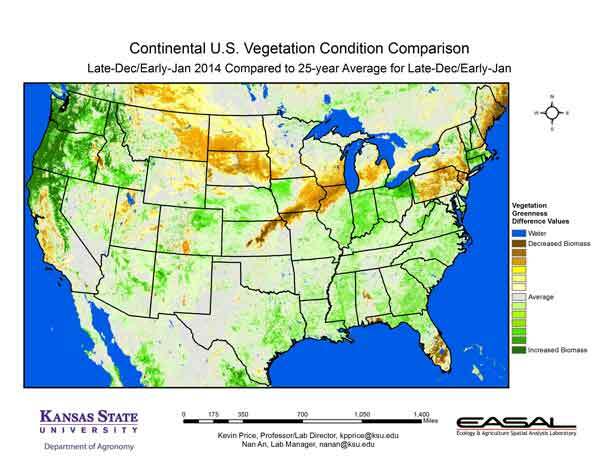 The Vegetation Condition Report for the U.S. for December 24 – January 6 from K-State’s Ecology and Agriculture Spatial Analysis Laboratory shows that snow was a feature for most of the northern and eastern U.S. It is noteworthy that snow along the Cascades in the Pacific Northwest has been limited, increasing drought concerns in the area. Figure 8. 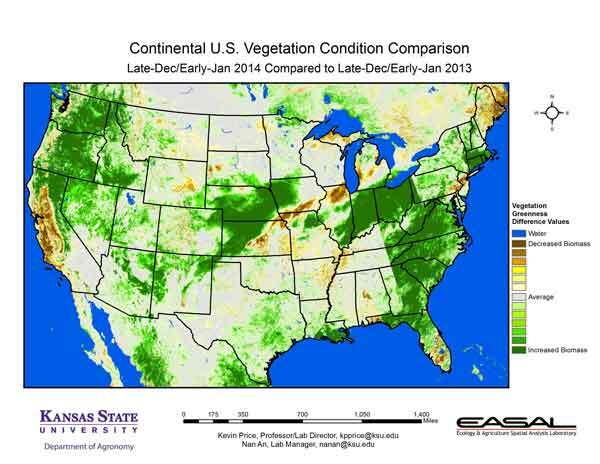 The U.S. comparison to last year at this time for the period December 24 – January 6 from K-State’s Ecology and Agriculture Spatial Analysis Laboratory shows that there is a very pronounced splice line in the eastern US, which is an artifact of cloud contamination. Areas of greater photosynthetic activity can be seen in the Pacific Northwest and the Central Plains. In the Pacific Northwest, this is due to limited snowfall. In the Intermountain West, average snow depth is 3 inches. Last year, the average snow depth was almost 8 inches. 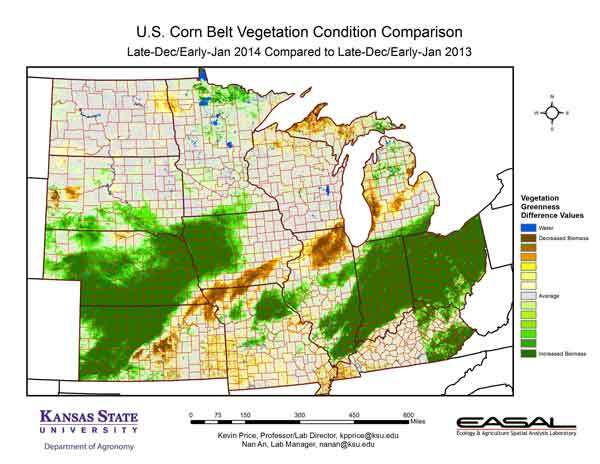 In the Central Plains, the major difference was more favorable fall moisture. Figure 9. The U.S. comparison to the 25-year average for the period December 24 – January 6 from K-State’s Ecology and Agriculture Spatial Analysis Laboratory shows that there is a very large area of greater-than-normal photosynthetic activity in the Pacific Northwest into central California. This is due to lower-than-average snowfall in the region. Since winter snowfall is a major source of moisture for the water year, this is increasing concerns for intensification of drought in the region.